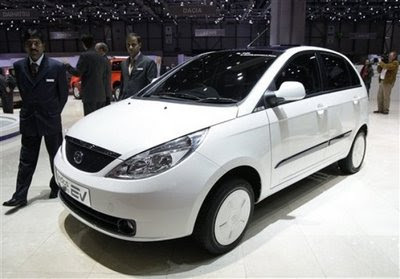 Indian manufacturer Tata has started production of electric cars in the UK. The firm, which owns Jaguar Land Rover, has taken on 23 people to help build 1,500 Vista models. The vehicle has a predicted range of up to 120 miles (200km), and manages 0-60 kmph in under 10 seconds, a spokesman said. It will cost between £25,000 to £30,000 with a £5,000 reduction on top through a government grant. The firm said it hopes they will to go on sale to the public some time next year and will assess demand after that. Steve Ocock, manufacturing general manager, said most car manufacturers are looking towards electric vehicles. "We are committed to this new technology," he said. "Everyone is looking at this (electric vehicle technology) and, as the volume of vehicles grow, they will become more cost-effective." He said the company will look at taking on more staff as production increases. More than 200 people are employed by the firm at its research and development centre on the University of Warwick campus in Coventry. Last October, Tata reversed a decision to close one of its Jaguar Land Rover manufacturing plants in the West Midlands after a pick-up in sales. It also said it would be hiring more staff to work for that brand.